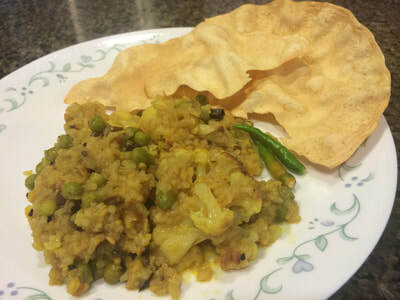 Kichuree, a rice and lentil dish- pure vegetarian dish cooked without onions and garlic. As use of onions and garlic in their food was a taboo. Aloo Posto is a delicious Bengali side dish generally eaten as a dry accompaniment to a meal of rice and curries.It is made from fried Potato With Poppy Seeds. Food means memories. Memories of family, home, culture, religion, social gatherings, land, era, experiences. Food memories are travellers. Mine travelled with me to Canada and stayed in my kitchen here. A link with my past. They gave me a sense of cultural familiarity and a way of establishing roots in a land away from my homeland. They gave me a sense of comfort. Yet, sometimes food stories also remind us that historically and culturally, access to and consumption of food can be sagas of shame and deprivation. Food taboos placed on Bengali Hindu widows showed how dictating food consumption or access can serve as a powerful instrument of gender-based social power. I am a Bengali, brought up in the Bengali tradition of four-course (minimum) meals. Our cuisine is elaborate and eaten course by course. It starts with a bitter vegetarian dish and ends with a sweet. Bengalis love their fish and are known for using every part of it. The staple food for a Bengali is maach- bhaat (fish and rice), prepared in a multitude of ways. Bengalis, it is said, are so attached to their fish that, unlike other in other states of India, even Brahmins eat it! Paradoxically, this love of fish was used as a means of shameful deprivation involving food in Bengal’s socio-cultural history. Food taboos placed on Bengali Hindu widows showed how dictating food consumption or access can serve as a powerful instrument of gender-based social power. No such strictures were placed on the Bengali widower. When a friend’s 70-year-old widowed aunt came to visit her in Calgary, social norms dictated that I invite her to dinner. Being a pure vegetarian she did not eat onions and garlic. This triggered memories of my grandmother wearing a pristine white sari and cooking an assortment of vegetarian dishes in her separate kitchen. One aspect of this memory was the joy that my grandmother’s cooking invoked. The other aspect was a sense of shame and guilt over the strictures associated with the pure vegetarian dishes that came from her kitchen in my old ancestral house. My memory of her wonderful Bengali vegetarian cuisine is entwined with the memory of the widow, clad in white, shunned from society, silently cooking in a separate corner kitchen, trying to transform the severe restrictions on her consumption into something desirable and appetizing. My memory of [my grandmother’s] wonderful Bengali vegetarian cuisine is entwined with the memory of the widow, clad in white, silently cooking in a separate corner kitchen. While menu-planning and navigating the memories of my grandmother’s dishes, I wondered which ones I could reasonably make in my kitchen here. Alu posto (potatoes cooked in poppy seeds), labra (a mixed vegetable using spinach, pumpkin, sweet potatoes and radish), eggplant in coconut mustard gravy… the list of options goes on. No onions, no garlic and no strong spices were used in these preparations, with green chillies giving the needed kick. Cumin seeds and a special herb mix of whole cumin seeds, fenugreek, mustard, fennel and black cumin seed (known as paanch phoron or five seeds) were used to temper the vegetables. Fresh ginger was used extensively too. Bananas, too, found creative use… all the parts of the plant were used to make different dishes. The fruit was eaten; the stem, called “thor” cooked as a stir fry using ground coconut and black cumin; and the banana blossom used in a delicious curry with potatoes. Just think of the ingenuity of the Bengali widows. They used whatever was around and in plenty. Ironically, the dishes they created had ingredients which were healthy and nutritious — turmeric, ginger, whole seeds. The widow faced with harsh restrictions and taboos placed on their consumption cleverly found substitutes for onion and garlic from the biodiversity around her. She had to be frugal and used kitchen refuse like vegetable peels, seeds and wild vegetation in her cooking, and the dishes she came up with are testament to her creativity. The appearance in elaborate Bengali cuisine of delicious items made from vegetable odds and ends… was a direct result of the harsh dietary rules for widows. Over the years, the appearance in elaborate Bengali cuisine of delicious items made from vegetable odds and ends, using only certain herbs and spices, was a direct result of the harsh dietary rules for widows. Given the multifarious ways in which vegetarian dishes are prepared, many of them are named for what goes into them and how they are cooked. For example a dish of potatoes (alu) is a simple “dom” (alur dom) dish, but when pumpkin pieces are added , it becomes a “chakka”; add a gourd vegetable and make a medium-thick gravy seasoned with ground spices, and a touch of ghee, it turns into a “dalna”. Similarly, there’s a glorious range of mixed vegetable dishes, each with a unique name based on how the vegetables have been used and cooked. There is the “ghanta”, the “chhachari”, the “chhechra”, the “chhechki” and the “labra”. The Bengali is not only gastronomically passionate but also has a zealous creativity with words. I am not sure who actually named the dishes. Maybe the Bengali widows did!